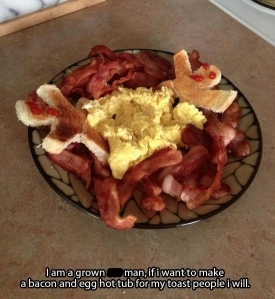 So this “grown man” calls it a bacon and egg hot tub for his toast people. I’m afraid that I saw a much more gruesome scene when I first saw this picture. For starters, they definitely look like they’re screaming…likely from drowning in this ‘hot tub’. The fact that the bacon looks more like giant worms, though, or potentially a volcano of scrambled eggs…. sets more of a horror film here. 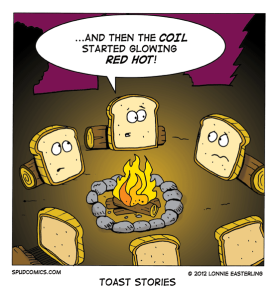 Which means ultimately, I end up imagining the scrambled eggs bubbling up like molten lava, engulfing the little toast people’s legs, while the bacon worms (Tremor-style) leap in and out of the bowl, attacking them ferociously…. Okay, so I might have some issues…. Don’t like pumpkins? 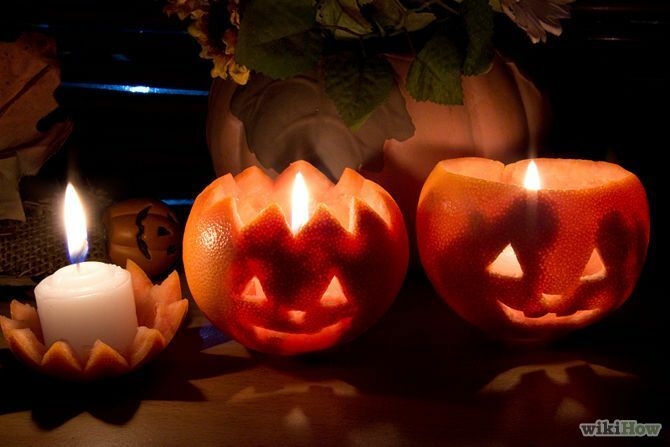 Make jack-o-lanterns from oranges! Well huh. I happen to love real jack-o-lanterns, but there’s no denying that it’s a time-consuming task that can feel more like work than fun by the end. Unless you’re super crafty and can spend tons of time making elaborate designs, then the thrill of carving pumpkins tends to die after a few years of making more or less the same face every year. These oranges are on a much smaller scale, though, and would be perfect for wanting to decorate and celebrate, but without as much effort and time. I imagine they’ll still be messy and the stickiness of oranges would rival pumpkins’ sliminess for which is worse. After a few times of lighting the candles inside, these would dry out and be ready to be tossed into the trash (or garbage disposal for an easy refresher!). Realistically, they’d probably sit on my own counter for far longer than that, but I can guarantee you that they’d still make it to the trash before the melting, molding pumpkins on my porch would. Oh, and at least with these, when you scoop out the middles, you can simply eat the insides immediately. I’ve had my fair share of throwing hacking up pumpkins for puree and roasted pumpkin seeds, but there’s something appealing about not having to put in nearly as much work for instant satisfaction with these.